Equation (4.7) is referred to as the eikonal equation. Surfaces of constant phase (P = constant) are the wavefronts, and the normals to these wave-fronts are the rays. Eikonal refers to the acoustic path length as a function of the path endpoints. Such rays are referred to as eigenrays when the endpoints are the source and receiver positions. 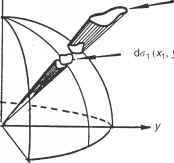 Differential ray equations can then be derived from the eikonal equation. Typically, four sets of eigenrays are considered (Figure 4.2): direct path (DP), RSR, RBR and refracted-surface-reflected-bottom-reflected (RSRBR). The physical models described in Chapter 3 are generally incorporated into ray models to account for boundary interaction and volumetric effects. Figure 4.2 Four basic types of eigenrays: DP, direct path; RSR, refracted-surface-reflected; RBR, refracted-bottom-reflected; RSRBR, refracted-surface-reflected-bottom-reflected. Figure 4.3 Geometry of a ray bundle. The geometrical acoustics approximation effectively limits the ray-theoretical approach to the high-frequency domain. An approximate guideline for defining high frequency is provided by the relation where f is the frequency, H the duct depth and c the speed of sound. are the sound speeds and dai is the ray bundle cross-section at x\,yi,z1 and da2 is the ray bundle cross-section at x2, y2, z2. As da2 approaches zero, A2 approaches infinity. Thus, ray theory does not hold in the vicinity of focal surfaces (caustics) and focal points. Focal surfaces, or caustics, are formed when the refractive properties of the ocean environment focus a number of adjacent rays into close proximity. There are two types of caustics: smooth and cusped. A cusp is actually the intersection of two smooth caustics. Examples of smooth and cusped caustics are presented in Figure 4.4. In the vicinity of caustics, a higher-order approximation can be used to yield predictions on the caustic itself, and also in the nearby shadow zone. One theory, developed by Sachs and Silbiger (1971), is essentially an approximate asymptotic method that predicts a spatially oscillating field amplitude on the illuminated side of the caustic. 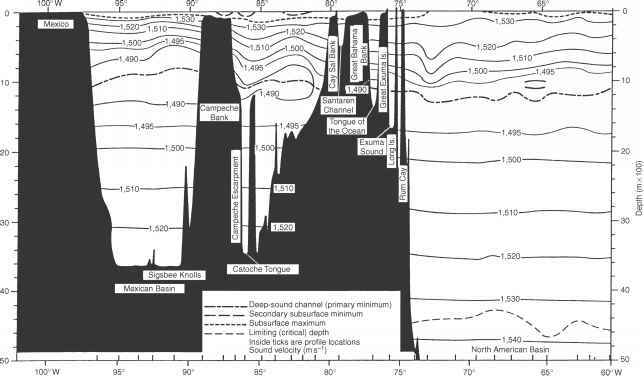 In the shadow zone, the field is damped with increasing distance from the caustic boundary. Boyles (1984: Chapter 5) provided a lucid description of caustic formation together with appropriate corrections to ray theory. With appropriate frequency-dependent (diffraction) corrections and proper evaluation of caustics, ray theory can be extended to frequencies lower than those normally associated with the geometrical acoustics approximation. Under these conditions, the approach is commonly termed "ray theory with corrections."